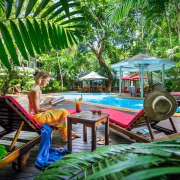 Located just 27km from Cairns or a 45 minute ferry ride; Green Island Resort offers a unique reef and rainforest nature experience in five star luxury. 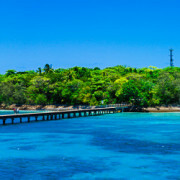 The only coral cay in the Great Barrier Reef with a rainforest, Green Island is home to over 120 species of native plants, colourful bird and marine life and beautiful coral gardens to explore. It is 15 hectares (approx 37 acres) in size and takes around 45 minutes to walk around. 46 luxurious suites are nestled amid lush rainforest and secluded from the day visitor facilities. There are many activities to choose from to explore the surrounding reef and island, or you can simply kick back by the pool and enjoy the resort atmosphere. The magic of the island comes alive at the end of the day when the day visitors have left and you have this unique piece of paradise all to yourself. Suites are ideally suited to couples, children under 14 years stay free when sharing existing bedding. Fitzroy Island is a continental island located about 30kms from Cairns (or a 45 minute ferry ride). The island is surrounded by fringing reef with 97% of the four square kilometres being National Park. This unspoilt island is covered in tropical rainforest, open woodland and mangroves which make for excellent and interesting walking trails. 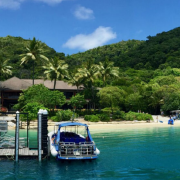 Fitzroy Island Resort offers a range of affordable 4.5 star resort facilities plus camping ground. Aimed at families and couples, rooms include ocean suites, self contained apartments, studio rooms and beach-side cabins. Resort facilities include a restaurant, pool & spa, swim-up pool bar, cinema, kids' games room, dive shop and plenty of activities, fun, games and adventure to awaken your inner child. Lizard Island is Australia’s northern most island beach resort, located 240km north of Cairns on The Great Barrier Reef. The island is a protected National Park, with just one resort, 40 rooms and suites, and 24 pristine sandy beaches. Access is by a 60 minute scenic flight from Cairns, where you can take in spectacular views of the Great Barrier Reef and the coastline. Lizard Island is consistently voted in the Top 10 Resorts of the World, and it is easy to see why. Exceptional attention to detail has been placed in all aspects of the resort, from the luxurious hotel rooms, to the fine dining and premium resort faciltiies. Your tariff includes gourmet meals, unlimited non alcoholic beverages, selected fine Australian and New Zealand Wines, beer, spirits and Champagne during meal periods at Osprey's Restaurant and Bar, picnic hampers for the adventurous, use of non motorised water sports and motorised dinghies. This is a special piece of paradise reserved only for a fortunate few, there are no day trippers here. Lizard Island does not cater for children 12 years and under. Orpheus Island is very much a secret to the outside world... Located 80km north of Townsville, the island accommodates just 34 guests at any one time. Access is via a 25 minute helicopter transfer from Townsville Airport, where you will fly over spectacular turquoise blue coral reefs. Orpheus stretches across 11 kilometres of immaculate coastline, and comprises of a pristine National Park and surrounding World Heritage listed Marine Park. There are many nature based activities to choose from with most included in the accommodation rates such as unlimited use of motorised dinghies, catamarans, kayaks, light fishing tackle and snorkelling equipment. The Beachfront Rooms are beautifully balanced between contemporary and minimalist, with natural colour schemes, fresh crisp white sheets and Li'tya toiletries. Daily accommodation rates include all gourmet meals, all non-alcoholic beverages, a selection of regional wines and beers, a nature-based activity each day and a variety of activities. 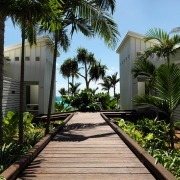 The island is suited to a couples intimate escape, however children are welcome. Magnetic Island is a 25 minute ferry ride from Townsville in Far North Queensland. 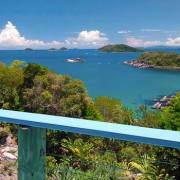 This World Heritage listed island encompasses 23 secluded beaches and bays framed by rocky granite headlands and magestic hoop pines. The island is a haven for the native wildlife including rock wallabies, possums and over 100 species of birdlife. The island is also home to the largest colony of koalas flourishing in their natural habitat. With a resident population of about 2,500 people, this 52km2 island features a variety of holiday resorts, shops and all the standard local services you would expect to support the local community. There is an excellent passenger ferry service that operates up to 14 return trips daily, and vehicular ferry with up to 7 return trips daily. Peppers Blue on Blue Resort is positioned on the waters edge in the heart of a waterfront precinct, just a leisurely stroll from the ferry terminal. Accommodation is contemporary and stylish with rooms and suites to suit couples, families and groups of friends. There is plenty to do on Magnetic Island which makes for a fun holiday adventure.